All’s fair in love, war and marketing, right? Well shortcut-seeking digital marketers looking to game Google’s authorship system are finding out that Google doesn’t agree. In fact, Google has begun to root out lower-quality authors with a new algorithm that penalizes them in searches. According to The Content Standard, Google has found patterns (including things like empty Google+ accounts and authors who are in no circles) that allow them to distinguish between authors providing quality content and those gaming the system. Thus, the new algorithm does not display images for all authors that Google has identified. It favors and is more likely to include images for authors who post quality content. 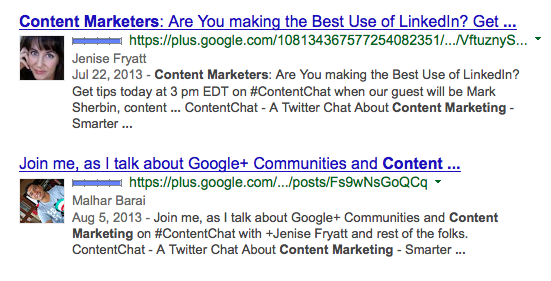 In addition, Google takes into account who the searcher has included in his or her Google+ circles. Suffice to say, if you are already producing quality content, you may want to increase your activity on Google+ to ensure you are doing everything possible to receive the benefits of the Google authorship program. Otherwise, just keep churning out content that your audience finds interesting and useful. And if you are still trying to avoid creating quality content, your options for ranking high in search results have just become more limited.